Home > Headlines > News > 2018 Mercedes-Benz Metris: Mercedes-Benz luxury with the versatility you want. The 2018 Mercedes-Benz Metris has been on the market for about two years and has already established itself as a van capable of meeting different needs. Although there are numerous versions of the Mercedes-Benz Metris, all offer a reasonable cost of ownership, significant fuel savings, and ample cargo space. The Mercedes-Benz Metris is available starting at $34,500 with a 126-inch wheelbase, while the 135-inch wheelbase version starts at $35,500. In both cases, it’s possible to get the Metris Passenger version or the Cargo model for the transport of goods. 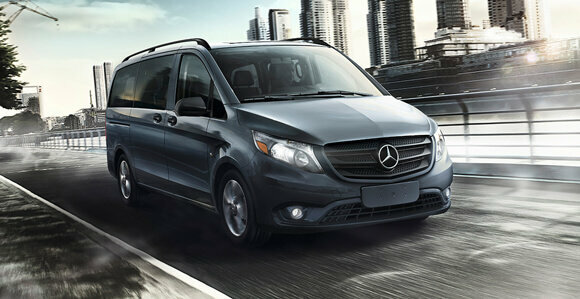 Like all Mercedes-Benz Vans, it’s possible to configure the rear space according to your needs. Space to fulfill all your needs. With the 2018 Mercedes-Benz Metris, you’ll never need more space. Whether you opt for the eight-passenger version or the Cargo model, the Metris will meet all your needs. The Metris offers up to 199.2 cubic feet of cargo space behind the front seats and has a payload of over 2,500 pounds. What makes the 2018 Mercedes-Benz Metris really interesting, however, is that it combines this impressive versatility with reduced fuel economy and greater agility thanks to its short-turning radius. Under the hood, it’s powered by a 2.0-litre turbo four-cylinder engine that develops 208 horsepower and 258 lb-ft of torque. This engine is paired with a seven-speed automatic transmission. It’s also possible to get the stop/start function that cuts off the engine power when the Metris is parked to reduce fuel consumption.